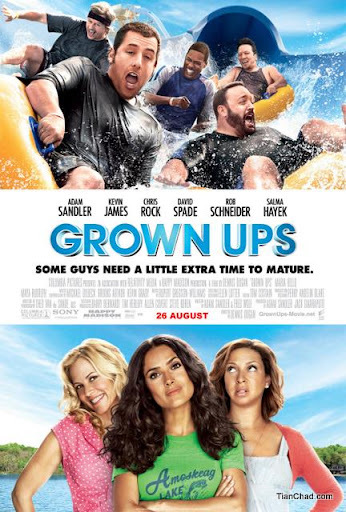 "Grown Ups, starring Adam Sandler, Kevin James, Chris Rock, Rob Schneider, and David Spade, is a comedy about five friends and former teammates who reunite years later to honor the passing of their childhood basketball coach. With their wives (Salma Hayek, Maria Bello, Maya Rudolph) and kids in tow, they spend the Fourth of July holiday weekend together at the lake house where they celebrated their championship years earlier. Picking up where they left off, they discover why growing older doesn’t mean growing up." Five grown ups were gathered together again after 30 years on their basketball coach funeral. What has changed after 30 years?? Four of them already have a family while one still single. Have you ever met a couple that has big age difference between each other? It is a big challenges I can say. Roxanne Chase-Feder (Salma Hayek) is one of the pretty cast that add extra points for the movie. She has a wonderful body measure!! Deanne (Maya Rudolph) and Kurt McKenzie (Chris Rock) in the kitchen at the Lake House. It seems like there is a big trend where woman go out for work while man stay at home to cook. Switch position between man and woman in this metrosexual age. After 30 years, are they still strong and tough enough to play basketball? It teach us that you don't have to always win in every competition =) Sometimes a little sacrifice can give people around you a lot more happier moment that you do!! Chris Rock, Kevin James with KFC bucket on his head, Rob Schneider, David Spade and Adam Sandler on the set of Columbia Pictures' GROWN UPS. Seems like KFC is one of the movie sponsor. Finger licking good ha? I like this movie very much because there are so many comedians in this movie. I read that Adam Sandler did share his funny joke for other characters in stead of keep for himself. This is what called "Sharing is Caring" ya! Must watch as you will really LOL non stop in the cinema~! We are suppose to watch 4-minute featurette on Paul Anderson discussing the making of Resident Evil: Afterlife in 3D in addition to the AXE-MAN (The Executioner) sequence in 3D that premiered at Comic Con. This movie was filmed with James Cameron/Vincent Pace Fusion Camera System for AVATAR. Due to certain circumstances of shipping issue, we only able to watch the 3D Trailer. However I gotta tell you, after experience the 3D version of Resident Evil. 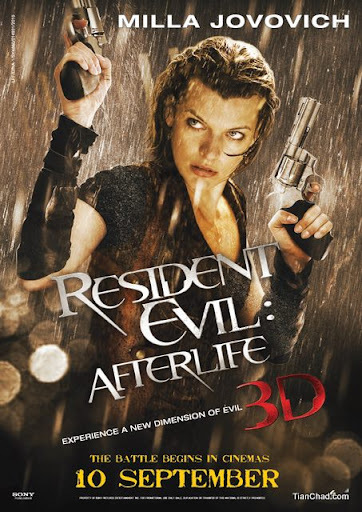 I can say it is really worth to watch Resident Evil: Afterlife in 3D. Super awesome 3D effetcs~! This is one of the scenes that can really draw your attention with their outstanding 3D effects~! I can't wait for this movie~!